This Burger King location has friendly and fast service. Nice place to stop by for lunch while at the mall. Went to Burger King at the Mall for a quick breakfast at lease once a week for a while now. Their $5 for 2 breakfast egg muffins are very tasty and reasonable priced. It is good!!! Staff are friendly. Gets very busy in the evening. Food tastes as expected. We eat here once in a week. This is a busy location but service is reasonably good. 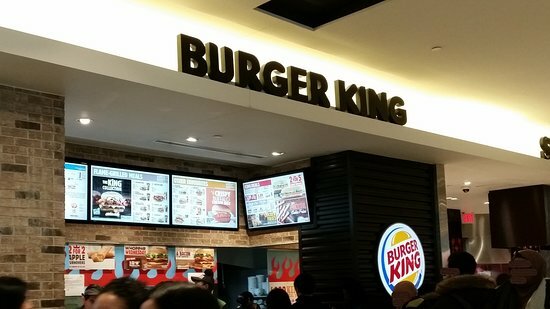 Food quality is consistent with other burger king locations. I had a fish burger, onion rings and drink. Quality and taste was good. Some times we would have a little lunch there. I liked the fish burger which was tasty. A good alternative place for lunch when shopping at Square One. Of all the burger joints we have found that Burger King provides the best bang for the buck. We had the Wopper and Junior Wopper meal deals. The 25 cent coffee is a good deal and the coffee is decent. Almost on par with McDonalds, but superior to Tim Horton's coffee. Food doesn't really appeal to my needs.